Air Hogs’ drones might not be as capable or maneuverable as those from companies like DJI and even GoPro now, but they’re incredibly easy for the average consumer to fly. And, more importantly, they’re available in versions that look like famous sci-fi spaceships, including this giant new flying Millennium Falcon. 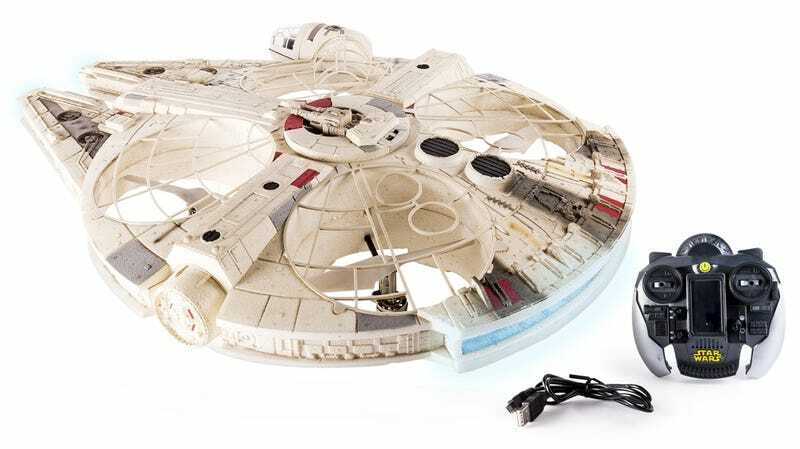 Available ahead of the holidays, this version of the Falcon measures in at an impressive 27-inches long making it large enough to include details like a glowing hyperdrive, lights and sounds, and even a miniature version of Chewbacca and Han Solo in the cockpit. Also available this Fall for $150 is a new Air Hogs Star Wars Speeder Bike drone that features similar height-lock technology as the Millennium Falcon drone allowing it to fly close to the ground just like it did in Return of the Jedi while racing through the forests of Endor. The Speeder Bike’s 2.4GHz wireless controller boasts a range topping out at around 200-feet, and the vehicle includes a Stormtrooper rider to help add to the realism. It’s probably just as susceptible to being destroyed in a head-on collision with a tree, but at least you don’t have to worry about Ewok attacks while you’re out flying it—unless you live on Endor. Share the post "Air Hogs’ Massive Millennium Falcon Drone Even Has a Tiny Han Solo and Chewie in the Cockpit"